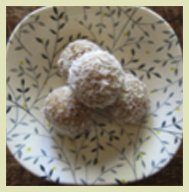 Xmas Cashew Truffles – These delicious snacks can also be used as a great Christmas gift idea. Combine cashew nuts, coconut and salt into a food processor and pulse until a fine crumb forms. Add remaining ingredients and process for two minutes until combined and sticky. Roll into balls and refrigerate to set. Cover in coconut if desired.